Plymouth Argyle made a loss of £1.46 million in 2013, according to the club's latest accounts. Argyle, who say losses have been cut, after reporting a deficit of £2.24 million for the 15 months to the end of 2012. The club were having gone into administration the previous March. 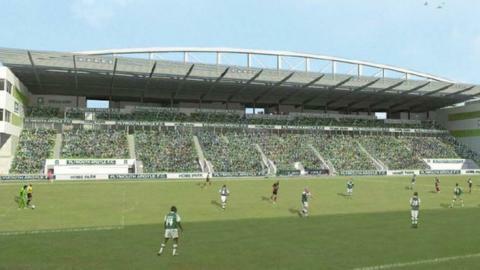 Work still has to start on at Home Park. The club as part of plans that include an ice rink, cinema and hotel. The club's losses include a depreciation charge of £515,000 which the club describe as "merely an accounting charge and does not impact on the club's cash resources". "Whilst the losses have increased the net liabilities of the club by £964,000 in the year, the burden of the increased indebtedness has fallen largely on the existing shareholders," said a club statement. "The historic nature of reporting audited accounts does not reflect the excellent progress that continues to be made financially," Argyle's statement added. "Operating losses are being eliminated and the club is projecting a small surplus before depreciation for the current season."